$3.1 M for seven years (FY2016 to 2023). 1:1 match up to 40% of the total project cost. Requests for co-funding from HBHL should be submitted at least 3 weeks before the CQDM or MEDTEQ deadlines. HBHL's Innovation Working Group (IWG) will oversee the evaluation. Co-funding is conditional upon obtaining an award from CQDM or MEDTEQ. Complete HBHL’s online submission form. Upload the CQDM or MEDTEQ application package. The Neuro-Partnerships Program envelope of $3.1 million is available until 2023. Under this program, Healthy Brains for Healthy Lives (HBHL) provides 1:1 matching funds for projects with a high potential impact on biopharmaceutical research through existing programs offered by the Ministère de l'Économie, de la Science et de l'Innovation (MESI). Co-funding is available for up to 40% of the total project cost. MEDTEQ Industrial Consortium for Research and Innovation in Medical Technologies. 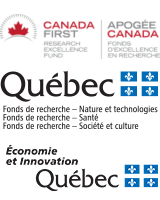 CQDM and MEDTEQ require that at least one of the project partners be a company registered in the Province of Quebec. HBHL requires that the Principal Investigator be McGill University faculty and be eligible to hold Tri-Agency research funding. Applications must be submitted during regular CQDM and MEDTEQ competitions. Project timelines will follow the schedules established by CQDM and MEDTEQ. Please submit your application for HBHL co-funding at least 3 weeks in advance of the CQDM or MEDTEQ deadlines. Ensure that requests for co-funding are supported by documentation that complies with the application criteria of both HBHL and the partner agency, CQDM or MEDTEQ. Complete the HBHL online submission form, and upload the completed CQDM or MEDTEQ application package. Please submit the package 3 weeks ahead of the CQDM or MEDTEQ deadline. Whether the funding request is reasonable in relation to the scope of work, total project budget, and other partner contributions. The McGill Innovation and Partnerships (I&P) Office will complete an Intellectual Property (IP) and commercialization assessment for each application, which will be sent to the IWG along with the assessment conducted by the reviewers. The IWG will then make a recommendation to the Scientific Steering Committee (SSC), which will make the final decision on the HBHL contribution. All HBHL co-funding is conditional upon obtaining an award from CQDM or MEDTEQ. Successful applicants will be sent a Notice of Award (NoA).